"INCREDIBLE DETERMINATION TO SURVIVE THROUGH LOVE, COURAGE AND STRENGTH!" One can only imagine the extraordinary suffering that took place, while living under Communist oppression and becoming a prisoner to horrific concentration camps. After viewing heart-wrenching movies about Hitler, his soldiers, and what happened to millions of innocent victims is beyond comprehension. The 'hell on earth' as perfectly described as the Holocaust leaves an aftermath in the lives of survivors of a nightmare lived through the worst evil humanity marked in history. Janina Stankiewicz Chung deserves the utmost respect to voice her painful experience to the world, a terrifying reminder of a personal journey in the battle for survival, under the most deplorable conditions known to mankind. The author describes the cold, harsh reality of prison, starvation, and abuse. She not only captures the horror and cruelty that swept through concentration camps, during this dark chapter in history, but conveys how unconditional love became the power of faith and perseverance to survive. The love between Sasha and Anya that they passed on to their family was the strength they held together through the trials-and-tribulations to live. I highly recommend this novel to contemporary historical lovers, and teachers. The story is deeply moving, compelling, educational, and inspiring. 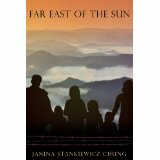 Janina Stankiewicz Chung defines hardship, rage, and fear through the lives of one family who found a miracle to escape. This tragic story that depicts the terror, brutality and humiliation endured through the lives of one family determined to survive, along with the author's testament about courage is indeed a worthy addition to the literature of the Holocaust. This book is powerful and tugs at the heart as the characters come to life. The descriptive, breathtaking story would make for a magnificent movie, based on overwhelming conditions in a horrific time period. This novel will leave an impression that will last for a lifetime through one story that's never to be forgotten. "FAR EAST OF THE SUN" is as captivating as Steven Spielberg's SURVIVORS OF THE HOLOCAUST.